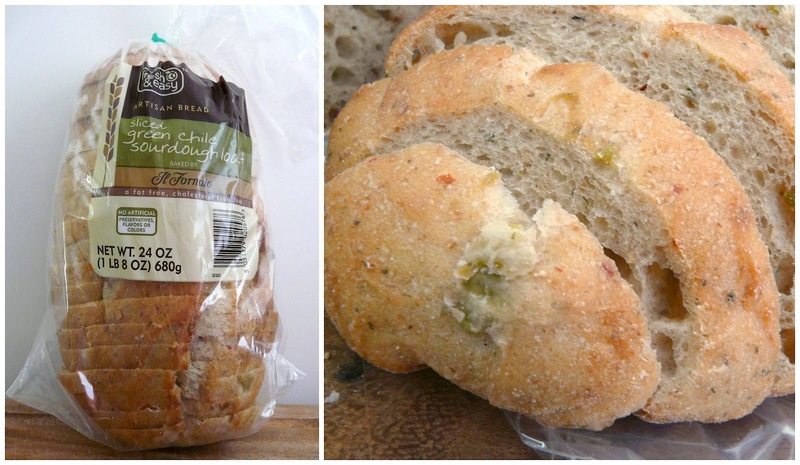 Today is my Fresh & Easy's Chile Sourdough Bread Appreciation Day. Actually, every day is a day like that because this particular bread is a mainstay of our diet but today I pay it some homage with this humble blog post. Price: $2.67 a loaf. Very well priced for artisan bread, imo. Notes: It's a somewhat dense bread that is excellent toasted or un-toasted. Since it's lacking in preservatives, I recommend that you consume it within a few days as I've found that it does get moldy in about 5 days, especially if the weather is warm. You can make it last a little longer if you refrigerate it but it will dry the bread out to a small degree. No matter! Toast it and all will be good! If you're bored and want some eye candy featuring F&E bread baked by Il Fornaio's chiseled, Nordic looking VP of Baking (who happens to be sooo easy on the eyes), watch this video. My most common use for this loaf is sandwiches served with a variety of cold cuts. My kids love it with oven roasted turkey breast piled with onion, lettuce and pickles. Sometimes, they'll have it with tuna or chicken salad and very occasionally, with peppered salami and sliced pickled jalapenos. (We're a chili loving family, can you tell?) In this post today, I'll share one of my favorite sandwich combos with you -- oven roasted turkey with mayo, arugula, sliced red onion, a sprinkle of pepper and "scented" with garlic. First, I'll start with lightly toasted F&E Chile Sourdough bread. I'm a huge garlic lover and though I want the taste of fresh garlic in my sandwich, I don't want the intense bite that comes with it. A good way to get the taste of it is to cut a piece of raw garlic into two and rub one half of it onto the warm toasted bread. It'll impart its very fragrant garlic scent onto the bread, almost like having garlic bread but without the butter. You'll definitely get a hint of the garlicky flavor but not the strong garlic breath that will ward off all your friends and family...unless you want to. Next, I spread my bread with mayo, then top it with sliced oven roasted turkey breast. The arugula comes next. Arugula is such a lovely herb. It has a bite to it and by itself has a bitterness which I don't mind. However, when eaten with other foods, in salads or sandwiches, it just gives the whole dish an earthy, peppery flavor which I love. After the arugula, I spread some sliced red onion on top followed by a healthy sprinkling of pepper and finally, the second slice of chile sourdough. So yummy!